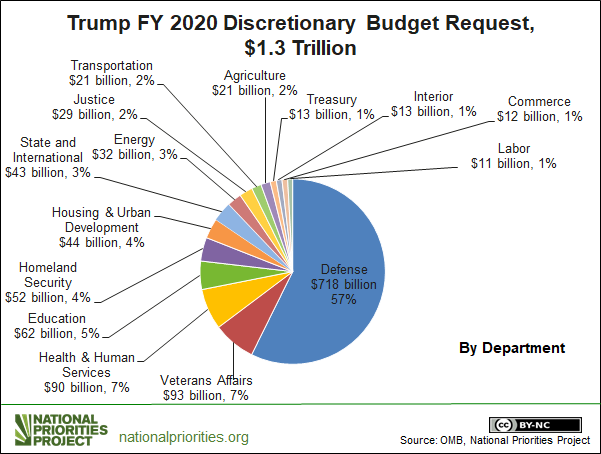 President Trump’s priorities for FY 2020 go even further than last year’s request in bloating the already enormous military budget, requesting $750 billion for the military —an increase of 5 percent, or $34 billion, from the 2019 enacted budget. That would put 57 percent of the $1.3 trillion discretionary budget into the Pentagon and nuclear weapons. Meanwhile, total funding for all other agencies, from the Department of Education to Veterans Affairs and NASA, is only $543 billion, down from $597 billion budgeted in 2019 - a nine percent decrease. The budget pretends to be fiscally responsible, but it relies to an unprecedented degree on one of the biggest budget gimmicks of the 21st century, a Pentagon slush fund known as the Overseas Contingency Operations. This account was first established to pay for wars in 2001, but has become a genie in a bottle for the fulfillment of any Pentagon wish that doesn’t fit in the regular budget. Administrations can claim to keep Pentagon spending under control, and stuff the extra into the slush fund. The Trump budget takes full advantage, more than doubling funding for this Pentagon slush fund, to $165 billion, up from $81 billion enacted last year. An additional $9 billion in the military budget is listed under “emergency requirements,” which may provide funds to build the border wall that President Trump is showing no signs of dropping as a political football. Reports from administration sources indicate that the president’s budget includes $8.6 billion to fund construction of a border wall, in addition to $3.6 billion to repay military construction funds he has attempted to seize to construct a wall. The top-line budget numbers released today in the president’s “A Budget for a Better America” document provide a broad outline of the President’s priorities — more specific numbers are expected to be released next week. But the document lays out some of the incredibly out-of-touch, militaristic items flagged for national security funding increases, like the “United States Space Force (USSF)” proposed as a sixth branch of the Armed Forces. And the budget touts the ramp-up of nuclear funds to begin a planned $1 trillion-plus renewed commitment to U.S. nuclear weapons capacity. The National Nuclear Security Administration (NNSA) of the Dept. of Energy gets an 8.9 percent boost to $16.5 billion for even more nuclear weapons proliferation. On border security, the FY 2020 budget proposes to increase funding for Customs and Border Protection (CBP) to $18.2 billion, and Immigration and Customs Enforcement (ICE) to $8.8 billion — up 19 percent from FY 2019. While pumping up all these facets of the militarized budget, Trump’s budget is proposing a 23.3 percent cut to the State Department, America’s major means of preventing military conflict through diplomacy, bringing it down to $42.8 billion. This is all while proposing massive cuts to agencies that actually meet human needs, like the Department of Education (down 12 percent to $62 billion), Housing and Urban Development (down 16.4 percent to $44.1 billion), Department of Transportation (down 21.5 percent to $21.4 billion), and the Department of Labor (down 9.7 percent to $10.9 billion). Among the hardest hit are the Environmental Protection Agency, brought down 31 percent to $6.1 billion, and the non-nuke portion of the Department of Energy, down 25.4 percent to $15.2 billion. So much for dealing with the actual existential threat of climate change! Of course, presidential budgets rarely come to pass. But President Trump’s intentions are clear, and if his recent willingness to shut down the federal government is any indication, there are plenty of fights ahead. « How Much Could We Buy With a 70% Top Marginal Tax Rate?